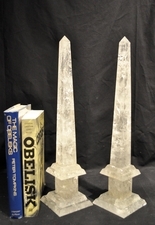 Only Obelisks offers a great selection of decorative obelisks in one place! 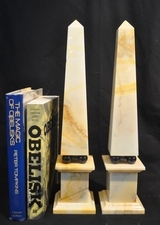 Browse our "Shop Obelisks" section for the latest offerings, and sign up for emails alerts as we add new obelisks. Impressive pair of tall rock crystal obelisks with wonderful occlusions in a classic design on a stepped platform. 31 1/2 inches tall. Pair of rock crystal obelisks on a stepped platform with very interesting occlusions allowing the light to catch and refract. 17 3/4 inches tall. Pair of Italian white carrara marble obelisks with subtle grey veining. 12 7/8 inches tall. Very attractive vintage alabaster obelisks in a neoclassical style. The creamy color of the alabaster has interesting shadows for a handsome presence. 19 1/2 inches tall. 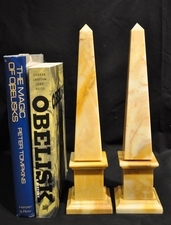 Vintage cream marble obelisks with yellow veining. The obelisks sits on black marble balls. 16 1/2 inches tall. 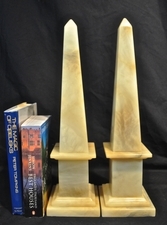 Pair of Italian creamy yellow Sienna marble obelisks. 12 1/4 inches tall. Vintage modern neoclassical style white marble obelisk with black marble at base of obelisk and plinth. 20 inches tall. 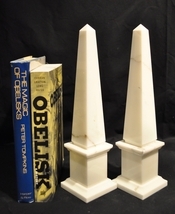 Only Obelisks specializes in decorative obelisks. Obelisks enhance any d�cor, from modern to classic. Take a look at our Obelisk Decorating blog for more ideas. Our obelisks range from modern to vintage to antique, and in a variety of styles (neoclassical, modern, chinoiserie�), materials (marble, metal, brass, malachite, lapis lazuli, rock crystal�) and sizes. Only Obelisks came about as a result of our passion for obelisks, and a fascination with their variety and versatility in d�cor. We believe that by specializing in only obelisks we can bring you the best selection. We are always on the look out for special sources, including estates and auctions. We choose obelisks that we find interesting and often unique. The antiques are particularly special. We love the 19th century and earlier French and Italian Grand Tour �souvenirs�, and the 19th century English Ashford marble inlaid obelisks, with their wonderful pietra dura technique. The vintage obelisks have tremendous character, and the marble and brass often develop a wonderful patina over time that adds to their uniqueness. Many decorators create groupings of obelisks in their interior design schemes, and many people find them fun to collect. We have a generous return policy, allowing you to try out your purchase in your d�cor, and return it to us for any reason in the condition received. We will gladly provide additional photos, and are happy to answer any questions by email or by phone.